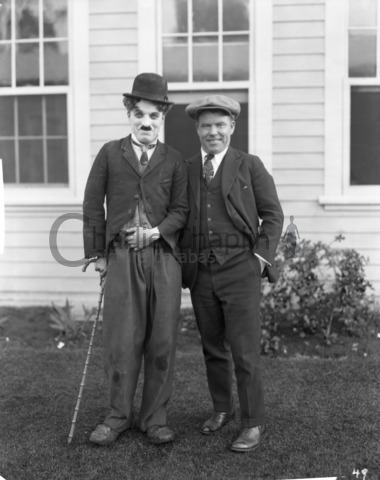 Charles Chaplin and Jim Tully during filming of "The Gold Rush"
A Chaplinesque conception of the Alaska which confronted the early gold seekers is presented in the opening scenes, which are merely shown as an atmospheric introduction to this comedy classic. These scenes represent an expenditure of more than £10,000, and were made in the High Sierras of the Californian Rockies. There a construction camp was laid for the building of the pioneers’ city. To make possible the cutting out of the pass, a club of young men, professional ski-jumpers, were employed to dig steps in the frozen snows at the topmost point, as there the pass is perpendicular and the ascent was made only after strenuous effort. When the building of the mining camp was effected, and the pass completed, special agents of the Southern Pacific Railway were asked to supply some twenty-five hundred men for this scene. In two days a great gathering of derelicts has assembled. They came with their own blanket packs on their backs; the frayed wanderers of the western nation. It was beggary on a holiday. A more rugged and picturesque gathering of men could hardly be imagined. They arrived at the improvised scene at Chilkoot Pass in special trains; and what is more, special trains of dining cars went ahead of them. It was thought best to keep the dining cars in full view of the derelicts. To have seen them going through the “ scene’ was a study in the fine qualities of human nature They trudge through the heavy snows of the narrow pass as if gold were actually to be their reward, and not just a day’s pay. To them what mattered ? They were to be seen in a picture with Chaplin the mightiest vagabond of them all. It would be a red letter day in their lives - the day they went over Chilkoot Pass with Charlie Chaplin. It is remarkable to relate that these men, untrained to trail through deep snows and climb the frozen ledges, while carrying huge packs on their backs besides hauling sleighs and other equipment over steep, precipitous places, suffered no serious accident.